I am re-posting my diary from my September 2013 trip to Japan. This is the report from September 14 with my girlfriend (now fiance) Jordan which recounts our visit to Hanshin Racecourse and Namba in Osaka. It was an early start this morning as Jordan and I took a visit to the Hanshin Racecourse, one of Japan’s horse tracks. I was invited to the facility by representatives of the Japan Racing Association (JRA) through connections at work. On the way to the track I noticed a lot of younger Japanese greeting older people with ‘Ohayou Gozaimasu” (Good morning) … this weekend is a holiday known as “Respect for the Aged”, so that’s probably one way it ties in. I was surprised at the amount of people who exited the train at the stop next to the racecourse! The crowd that exited the train for the ordinary Saturday races would be typical in the US if a big race were being run… think the Belmont Stakes. As promised, Mr. Tanaka, representative from the JRA, was waiting at the entrance and escorted us through the paddock area to the front of the grandstand. The entire place was enormous, and the popularity of the sport in Japan justifies the very long grandstand. Mr. Tanaka pointed out the “Turf Vision” HD screen in the infield, then escorted us to our seats on the fourth floor, right in front of the CCTV operation. After a few minutes, he brought us in for a tour of CCTV… there are about 20 control room operators and 20 camera operators at the track, and broadcast control was very spacious. Towards the end of our visit, Keisuke Morimoto, the CCTV producer that I met during his visit to Aqueduct earlier in the year, stopped by to say hello. 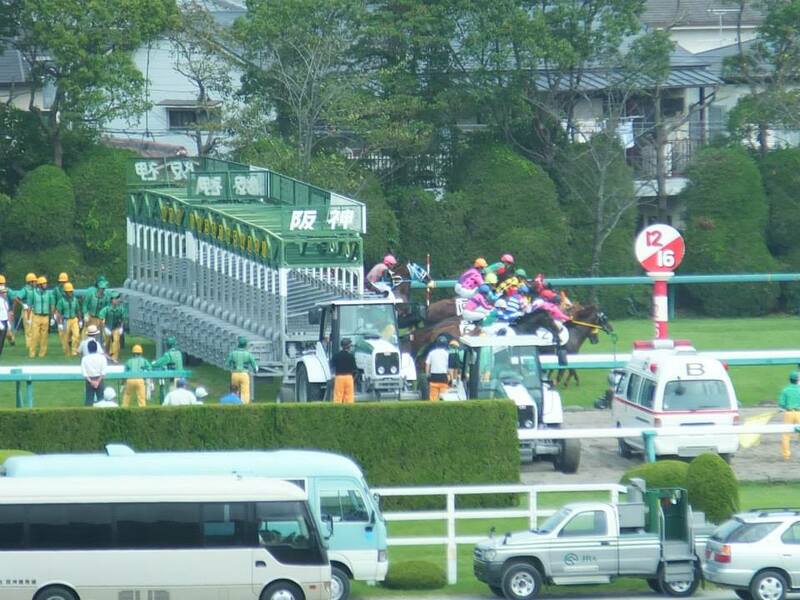 We stayed for 8 races, including the featured Hanshin Jump Stakes which we enjoyed very much. Of course, Jordan left very happy as she had a 3,000yen ($30) winner in one of the races! And of course I was broke…. Much thanks to the JRA for accommodating us, and for leaving us with some presents prior to our departure. We did some shopping and one of the shopkeepers recommended we go to Fugetsu Okonomiyaki… the same chain that we visited a couple of days ago in Tempozan. 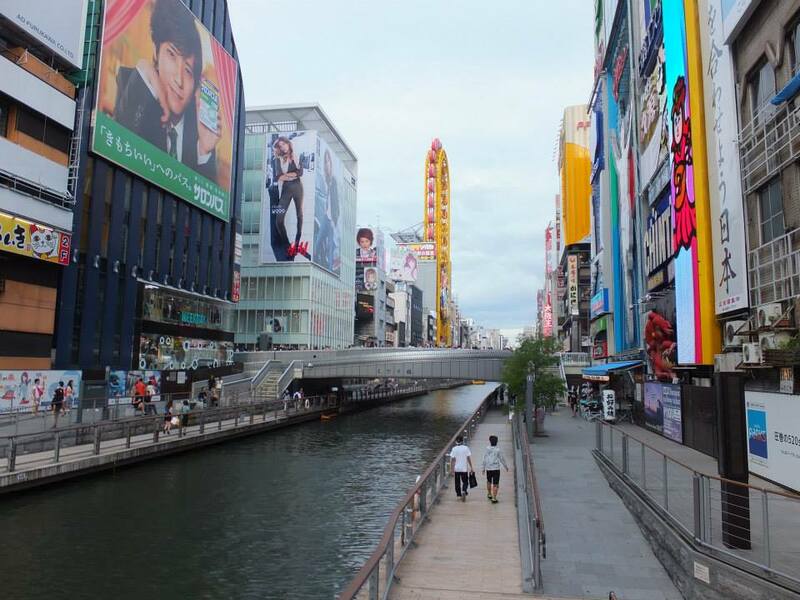 After that it was a quick trip over to see Dotonbori canal and the “Glico Man”, one of the trademarks of Osaka – it is a neon advertisement of a running man that has been standing in Osaka since the 1930’s. After some more shopping, we returned to Kyoto and called it an evening. As you read, my first visit to a racetrack outside of the United States was phenominal. Jordan and I were both stunned, struggling to see how we could compare Hanshin to other tracks in the United States. We just could not. The atmosphere was great, and the fans were friendly and passionate. 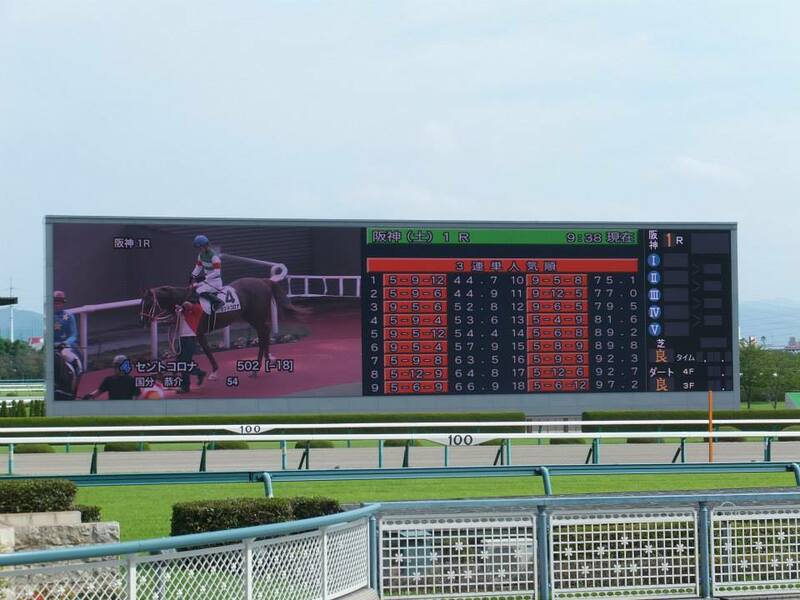 Much as we would have loved to stay for all 12 races – which is typical of a JRA card – we had to press on with our plans. It was nice to visit Namba and Dotonbori for the second time – Dotonbori is the area around the canal near Namba. We picked up a bag from a store in the shopping complex at Namba station for Jordan’s sister. It was the sales clerk that eventually redirected us to what winded up being another Fugetsu for another dose of okonomiyaki! Needless to say, we saved a lot of money today by using the Thru Pass for foreigners! Since we had a little bit of extra money we opted to pay a surcharge to take Kintetsu’s premium train services back to Kyoto. A little circuitous, but it was very fast, very comfortable, and we were able to avoid the commuter train crowds during the evening hours. Oh yes, we could eat too. 🙂 I believe the surcharge was 870 yen per person to go back this way.